The contents of Kim Barnett’s report on the state of Derbyshire cricket will almost certainly have made chastening reading after a season of disappointment on the field and some unexplained developments off it. Barnett submitted his assessment to Derbyshire’s supervisory board earlier this week against a background of understandable disenchantment from members and supporters. 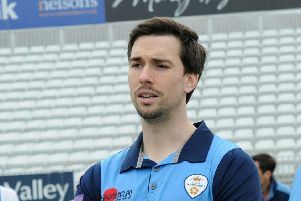 Anything less would be a major surprise with the team on course to equal the unwanted record set in 1924 when Derbyshire failed to win a single championship game and with no satisfactory answers forthcoming regarding the absence of senior players, principally New Zealand batsman Hamish Rutherford. Perhaps that elusive victory would have been secured if rain had not washed out the final day of last week’s Gloucestershire match when an outstanding innings of character and defiance by Alex Hughes turned the contest on its head. A career-best 140 by the 24-year-old all rounder will have impressed the club president and former captain given how it was forged in adversity and no doubt earned a tick in the positive column of Barnett’s report. Hughes has played little four day cricket this season and his elevation to number three had raised a few eyebrows until he batted with such conviction last Friday. Head coach John Sadler said the decision to promote him in the order was a joint one. “It was all of us really. Myself, Billy (Godleman) and senior players chat things through and decide on what is best for the team moving forward. “At that time it was for Alex to step up and he was keen as mustard to move up to three and he’s taken his chance. “It was superb and is the best I’ve seen Alex play. The way he had to fight in the first hour when the clouds were in and it was swinging and nipping around was very impressive. “They bowled well and hit the pitch hard but the way he battled through and stuck to his plans earned him the right to play more aggressive cricket as the day went on.